4 Too Little Amino Acids? 5.2 How Does A Muscle Contract? The analysis of the relevant physiological processes shows why supplementation can be effective in improving training effectiveness. Muscle growth or Bodybuilding is the intentional growth of targeted muscle tissue caused by resistance training. Using a variety of training methods an athlete is able to achieve muscle hypertrophy. Hypertrophy is an increase in the size of a muscle through an increase in the size of its component cells. A similar effect called hyperplasia refers to an increase in the number of cells or fibers. 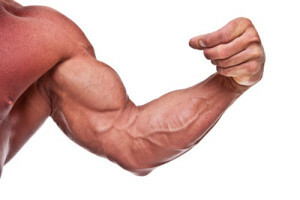 A muscle can either grow in size by increasing the diameter of the muscle fibres, whilst the number of fibres remains constant. This is possible only if the muscle is strained beyond a normal performance level. Nerves will fire a growth stimulus, which causes protein deposits in the muscle tissue to increase. If the body responds to training with hyperplasia, it will build new muscle fibres altogether, which may also grow in size at a later stage. Today’s athletes have access to a large variety of supplements in order to achieve faster and more efficient muscle growth and avoid unwanted muscle atrophy (shrinkage) caused by overtraining or poor nutrition. Amino acids are particularly effective in growing and repairing muscle tissue, because it consists mainly of protein. A large number of natural nutrients are central to the building and maintenance of muscle strength and endurance. For this reason should bodybuilders and other athletes always make sure that they have a comprehensive and balanced diet. In case of undersupply of important nutrients the body will break down muscle tissue to use the its components to repair tissue damaged during training. This will result in an unwanted reduction of overall muscle mass (atrophy). A muscular body also has an increased basic energy consumption and therefore needs more energy without actually exercising. Building muscle during when attempting to lose weight is therefore sensible, because larger muscles consume more energy also reducing the possibility of regaining fat afterwards. Muscles represent a complete organ essential to the body and mainly responsible for mechanical movement. Muscles are able to move both internal and external structures of the body. This means that they are essential for both the active, physical movement of the individual as well as many involuntary, internal processes such as the beating of the heart or digestion of food. The different types of muscle are classified via their histological structure and actual mechanism for contraction. Two main types of muscle are differentiated: the smooth and the striated (skeletal) muscle. 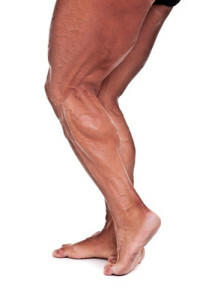 Types of striated muscle are the skeletal muscles as well as the heart muscle, which has a unique structure to accomodate its incredible performance over a human being’s lifetime. An individual can control skeletal muscles at will. This enables physical movement in one’s environment. The heart and the smooth muscles on the other hand cannot be controlled consciously, because they are controlled by the peripheral nervous system. Striated or visceral muscles are found mostly in the organs such as stomach and intestines. A muscle contraction is always initiated by a nervous impulse. This causes the two main protein molecules (Aktin und Myosin) inside the muscle fibres to move relative to each other resulting in shortening (contracting) and lengthening (relaxing) muscle movement. A healthy adult has 656 muscles, which make up 23 – 40 % of the total body mass. Muscles have to work hard every day. Especially the largest muscles in the body, the glutes (behind), quads and hamstrings (thighs) work constantly to help us walk. Together with the nervous system they are a major consumer of the energy available to the body. Muscles always work in pairs to balance each other out. An agonist (player) such as the biceps or hamstring always has an antagonist (opponent), i.e. the triceps or quadriceps respectively. This relationship is important to protect them from over-stretching and resulting injuries. The body automatically and constantly adjusts to the increased demand of power and strength training by adapting its main metabolic processes, the central nervous system and kinetic mechanism (mechanical movement of bone by means of muscle contraction). This automatic adjustment takes place in order to increase its efficiency and maximum ability to excerpt power. In fact, the body already begins to initiate this improved nerve and muscle coordination from the very initial stages of conditioning and training. The overall metabolic system also adapts immediately to the increased metabolic demands of the muscle apparatus. Muscle mass as well as the nutritional supply systems begins to grow and in order to build excess capacity. All these adjustments can be effectively supported and improved by an appropriate dietary supplementation regime as explained below. Many importnat nutrients will support the growth of muscle and contribute to the training effect (performance adjustment caused by strain) on the body. Products which include protein help to build muscle mass and strength in the short and medium term. Athletes and body builders therefore frequently consume and supplement foods very high in protein. Amino acids in particular are used specifically to build muscle and can produce impressive results in an entirely natural way. Supplements have become increasingly popular, because nutrient quantities absorbed with normal food generally do not suffice to cover the increased demands of athletes. Several of the nutrients required to build muscle mass are essential, which means the body is not able to produce them by itself. Although they can be absorbed by foods it is often more efficient and effective to consume them in larger quantities via dietary supplements. Branched-chain amino acids (BCAA) such as L-leucine are especially important. They dramatically improve the body’s ability to synthesise protein and thus build muscle mass after supplementing of just two weeks (4gram three times daily)1. L-leucine is also essential to the human and should therefore be consumed via dietary supplements . Branched-chain amino acids (BCAA) are a key nutrient for muscle repair and growth inhibiting the reduction muscle of protein at the same time. They are also important as energy transporters to the muscles in the body. Depending on the level of exercise they need large amounts of readily metabolisable energy as well as a sufficient amount of oxygen. Japanese researchers proved in 2011 hat Vitamin C is essential for the preservation of the human body’s ability to perform physically. They specifically investigated the interdependency of the Vitamin C concentration and the body’s ability to perform muscle contractions. They were able to show that Vitamin C plays an important role in muscle strength and is inversely correlated with the BMI (Body-Mass-Index). It can therefore help to reduce weight. 2. Taurine is able to reduce the oxidative stress (tissue breakdown) following intense exercise and thus positively influence muscle growth and increase performance. When skeletal muscle is strained to a large degree, the body naturally builds free radicals which can damage the cells in the muscle tissue. Appropriate supplementation of Taurine will prevent the production of superoxide-anions and reduce the oxidative stress on the muscle tissue. 3. At the same time it increases the content of Thiol in the skeletal muscle neutralising various nitrogen-based radicals. This reduction of oxidative destruction results in an overall improvement in muscular performance. L-arginine is an amino acid well-known to muscle and strength builders. Blood flow and effectiveness of the immune system increase as a result of additional intake of Arginine. There are no clinical studies on how L-arginine itself influences muscle hypertrophy. Recommended doses for athletes are between 4,000 mg und 8,000 mg per day. L-Carnitine is probably the most well-known amino acid in sport. The amino acid L-carnitine transports fat molecules into the mitochondria (cell’s power plants). The mitochondria converted the fat molecules into energy. Consuming additional Carnitine decreases the chance that the body breaks down muscle tissue to produce nutrients and energy. L-carnitine is therefore an essential component of an athlete’s nutritional plan. L-glutamine is a very important non-essential amino acids for humans. Although the body can produce it, immune system weaknesses and nerve problems can occur during times of high demand. Our body uses L-glutamine to create proteins, so-called amino sugars, and to support the production of the super-antioxidant glutathione. This protein has an important protective and anti-ageing effect on the body. Glutamine is therefore a very popular supplement with strength athletes. Among the free amino acids, L-glutamine is the most abundant at around 20% of the total. It also exists in a peptide-bonded state, which makes it chemically very stable. Many studies have shown that the consumption of particular food supplements can support the body’s ability to build muscle naturally. Amino acids are especially important, because they are the building blocks of protein, which makes up muscle tissue. Especially L-leucine is important for the continuous growth and avoidance of breakdown of muscle tissue. The body needs much more energy and nutrients during periods of increased strain such as exercise. Consuming food supplements 30min before training ensures that they are readily ingested and available in the blood stream for transportation into the muscles. The human body adapts to training quickly and especially over longer periods of time improves efficiency and effectiveness of muscles and coordination to deal with the demands of intense training. The overriding effect is an increased ability to perform at high levels. Consuming dietary supplements can effectively support this.